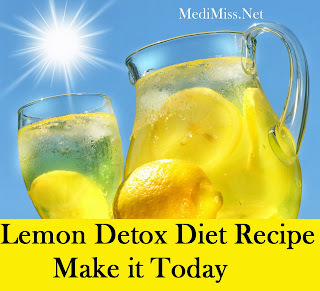 The lemon detox diet recipe is by far the most requested of any of the detox type recipes available online. This is due to the high media coverage the detox diet drink has received on American and British television. I must say though that it does worry me that many who take up this diet do so without consulting their doctor or without any preparation. Before I give you the recipe I'm going to take a little of your time to make sure that your detox experience is as rewarding and safe as possible. Firstly as I have already said before starting any detox diet plan consult your doctor. We are all unique and just because a detox diet works safely for one person does not mean it is ideal for everybody. Secondly donâ€™t simply switch from you normal high junk food, high processed food, high caffeine intake and alcohol diet straight to a harsh detox diet. If you do the chances are high that you will fail. Make sure at least a few days before you start a detox plan that to start cutting down on the foodstuffs you know you are going to grave. Many who do detox do feel ill for at least a couple of days. Symptoms can include feeling lightheaded, nausea and feeling week. These symptoms are common and usually last a few days. If you continue to feel ill consult your doctor. If you can't cope with the symptoms then stop the detox plan. Using a spoon stir well. Add 4 oz of cold water then stir again. You should also have a large glass of water each day with 1 teaspoon of salt as this helps stimulate bowl movements. If you can't stomach the salt water drink this can be substituted with one teaspoon of senna tea replacing the salt. Take either the salt or senna tea solution in the evening. You should drink at least 6 to 10 glasses of the lemon drink each day and have nothing else apart from the salt or tea drink. The detox process is meant to be followed for between 3 to 7 days.